Equipped with a powerful Dual 24MP camera system in the front, the newest nova features a total of four cameras powered by Artificial Intelligence (AI). The HUAWEI nova 3i made its successful debut last Saturday, 28 July with a robust sales outcome. The HUAWEI nova 3i retails at the attractive price of RM1,249. Building on that success, you can now own a HUAWEI nova 3i easily via attractive postpaid plans. Celcom customer can now own the new HUAWEI nova 3i for FREE when they register for the Celcom Mobile Platinum at RM148 per month, where they can enjoy Unlimited Calls with 60GB Internet. Adding to the excitement, customers will also get an unlimited iflix VIP Access streaming. What’s more? Celcom is also offering its users free 100GB Super Video Walla™. For more information of the plan, please refer HERE. 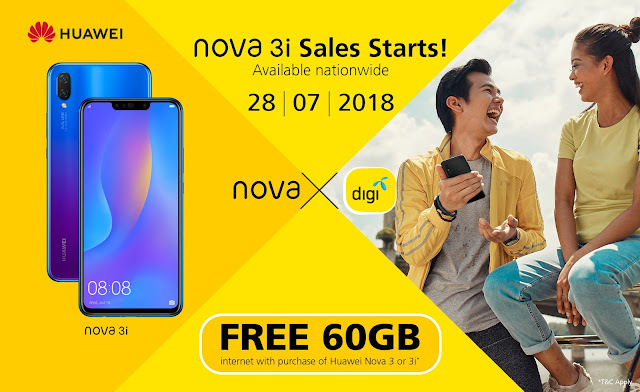 Digi customer can purchase the new HUAWEI nova 3i for only RM1 with Digi Postpaid Plan 190 and 160. These plans entitle Digi users to enjoy unlimited calls, 100GB and 70GB respectively for home internet data and they can still keep in touch with their family and friends when they are abroad with 5GB Internet Data + 60 minutes calls for free. More rewards for nova users as HUAWEI collaborates with Digi to announce a complimentary of 60GB internet data plan for all new HUAWEI nova 3i users. Exclusively for Digi members, this offer is applicable to new registrations, port-ins, and existing Digi Postpaid (mobile) customers who are on the Digi Postpaid 80 plan and above, excluding Digi Postpaid Family Plans. Digi users need to purchase the new HUAWEI nova 3i at any HUAWEI Experience Store, Display Zones or authorized dealers, where customers will be given a Nova Membership Card. Simply by scanning in the QR code provided, customers can download the HUAWEI VIP App, browse through the list of in-app rewards they are entitled to, and click on the Digi brand to redeem the free 60GB Internet promotional code. Lastly, they hop on to digi.my/nova3 and key in the promotional code to register their free internet. Maxis customers can purchase the new HUAWEI nova 3i for only RM1 when they sign up for MaxisONE Plan 158 with a 24-month contract. As standard, MOP ( Maxis One Plan ) 158 comes with 50GB of Internet data with no weekday or weekend restrictions, as well as unlimited calls and SMS. This promotion is valid from 28th July, 2018. For more information, please visit https://consumer.huawei.com/my/ or HUAWEI’s official Facebook page www.facebook.com/HuaweiMobileMY.